Homeschooling in high school is a worthy endeavor filled with blessings and challenges for students and parents. The information on this page has been compiled to give parents who are homeschooling high school students with First Baptist Opelika Christian School some helpful information as they journey toward a high school diploma. Diplomas will be issued to students who successfully complete a high school curriculum approved by the principal. 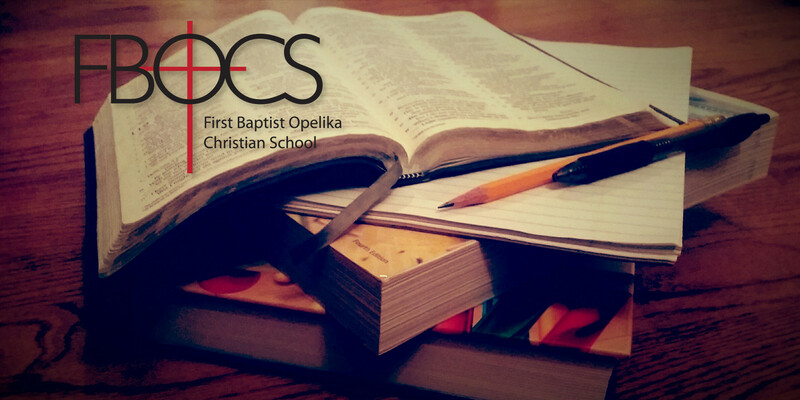 Students who wish to receive a diploma from First Baptist Opelika Christian School must be enrolled for their full senior year. Diplomas will not be issued until all required paperwork is completed and returned to the principal by the due date. Online graduation requirement worksheets are provided for our members. The FBOCS Principal updates these worksheets each year as students complete courses and earn credits so that families have an ongoing record of coursework completed toward graduation. Parents are encouraged to use these worksheets for planning out high school coursework and tracking progress toward graduation requirements. Submit annual enrollment forms with fees by June 30 each year. Submit High School Course of Study for each high school student by July 15. Develop and maintain a daily plan book that includes lesson plans and days of attendance. Submit High School Bimonthly Attendance/Progress Reports by the due dates. Submit High School Documentation for Completed Courses and Annual Attendance Record for each high school student by June 10. Parents who home school in the high school years should understand that they are not expected to personally teach their high school students every course required for graduation. The advanced nature of many high school topics usually necessitates outside help. Parents are encouraged to investigate the wide variety of high school course options available, including home study textbooks or video instruction, local classes, online classes, tutoring, and dual enrollment. By the high school years, the parent’s role often shifts from teacher to educational planner and manager. High school students should be ready for more self-directed learning while parents provide oversight, accountability, and encouragement. One of the beauties of homeschooling in the high school years is the ability to tailor coursework to the particular interests and aptitudes of a student. A listing of Possible Course Ideas is provided to help parents consider the wide range of options available. Sometimes parents may wish to develop a course rather than using an established curriculum. Such a course would need to contain the length and content of a comparable high school level course. High school English instruction should include grammar, composition, and literature every year in order to give your student a solid foundation for life and later college work. However, it is not necessary for every English course to incorporate all of these elements simultaneously. A semester composition course followed by a semester of literature where both address grammar in an ongoing way would be an excellent way to create an English credit. Science labs often raise questions for home school high school parents. When possible, parents should try to provide a hands-on lab experience with every required science course in order to better prepare students for college science work. FBOCS transcripts reflect whether a science course included a lab component or not. Many students participate in labs through local classes or dual enrollment. Labs may be completed at home using readily-available kits designed around specific textbook series such as Apologia or Bob Jones. Whether labs are done at home or away, have your student maintain a lab notebook where experimental data, observations, analysis, drawings, etc are recorded. Math in the high school years can be a challenge for many home schooling parents. Students in our technology-oriented culture are increasingly moving into algebra and geometry even before the high school years. This means our students have the potential to move far beyond our comfort level with math instruction during their high school years. Parents are urged to diligently search out excellent math teaching resources, from local classes to online instruction. An inconsistent or sluggish approach to math can prevent students with an aptitude for higher level math from ever reaching advanced topics, narrowing their future college and employment opportunities. We hope this Thoughts on High School Math article will prompt parents to aim for excellence in homeschool math courses. High school credit cannot be earned for courses with different names but the same content. Similarly, students may not earn credit for a course that is a prerequisite for a course already completed. Post-secondary enrollment (also known as dual or joint enrollment) concurrent with high school studies can be a helpful way for students to satisfy graduation requirements. Parents contemplating dual enrollment should realize that their student will be operating in a college environment. Dual enrolled students should already have solid study skills and good time-management habits. The student is responsible to obtain the necessary form(s) from the institution and obtain the appropriate signatures. The student is also responsible to make sure the institution mails an official transcript to First Baptist Opelika Christian School in order for the grades to apply to the high school transcript. Examples of institutions where FBOCS students have dual enrolled include Auburn University, Southern Union Community College, Troy University, and Liberty University. FBOCS follows state guidelines on awarding high school credit for dual enrollment coursework. In general, one 3-hr semester hour college course will equal one high school credit. However, high school English 11 and English 12 have additional requirements for earning credit through dual enrollment since these high school courses must include both composition and literature. A dual enrollment composition course may be combined with either a high school or dual enrollment literature course to create English 11 or English 12. Alternately, a student may take two dual enrollment composition courses in 11th grade to earn English 11 followed by two dual enrollment literature courses in 12th grade to earn English 12. A student may exempt one or both dual enrollment composition courses through ACT or SAT scores according to the guidelines of the dual enrollment institution. In this case, the student will have satisfied the corresponding composition requirements for English 11 or English 12 if taking dual enrollment literature in either 11th or 12th grades. A credit is an educational measurement which represents time spent in a course of study. Simply put, one credit equals one year’s worth of course work. One-half credit equals one semester’s work. There are basically two ways to earn high school credit. The first is to complete a traditional curriculum for a particular subject and receive one credit for a full year course or one-half credit for a one-semester course. The second way to earn a high school credit is to keep a record of clock hours spent on a course until the sufficient number of clock hours have been accumulated to earn one credit or one-half credit. This approach is based on the Carnegie Unit in which one unit of high school credit equals the total number of school days multiplied by 45-50 minutes per day. The number of clock hours required by First Baptist Opelika Christian School is 140 hours for one credit and 70 hours for one-half credit. A clock hour approach is often used for creating credits from activities such as sports, music lessons, community service, etc. The student must able to document hours spent on an activity in order to earn the credit. The printable Subject Planner includes an hour check-off chart to help students create a written log of their work. FBOCS uses the following grading scale: A=90-100, B=80-89, C=70-79, D=60-69, F=0-59. Parents use this grading scale to report letter grades on the High School Documentation for Completed Courses form at the end of each school year. Parents of high school students are advised that, while FBOCS only requires letter grades to be reported, occasionally scholarship applications or other forms may request a numerical grade average. If a numerical grade average is requested on a form that the principal is asked to sign, it is the responsibility of the parents to keep adequate records of graded coursework and supply the principal with a numerical grade average to include on the form. The principal can only supply a GPA on a 4.0 scale computed from reported letter grades. These numbers are added and then divided by the total number of credit hours. Now divide 19.5 by 6 credit hours to compute a 3.25 GPA. Official transcripts will be sent directly to any post-secondary school, agency or institution at the student’s request. The first five official transcripts and unofficial parent copy will be provided at no charge. A fee of $5 is charged for each additional transcript. If a transcript is required in less than the normal two-week processing period, an additional $10 rush fee must accompany the request. Transcripts will include only those courses taken in the high school years, completed no earlier than the eighth grade with the minimum age of 13 by September 1, in which the content is at high school level or above. Prior approval is required for courses considered for credit prior to ninth grade. Transfer students from other schools or home study programs must provide the principal with a complete transcript including all high school courses completed, grades achieved, and credit hours earned. First Baptist Opelika Christian School does not issue “weighted” grades unless approved by the principal and the weighted course meets the criteria for an AP or Honors course. Courses that are transferred to First Baptist Opelika Christian School from another school will be given the same weight that the previous school issued in computing the grade point average. The ACT and the SAT are entrance exams that colleges and universities require as part of the registration process. Most colleges will accept either test. Both tests can be taken as many times as the student wishes. Some colleges will take the highest composite score while others take the highest score for each part of the test. FBOCS encourages high school students to take the ACT and/or SAT no later than the spring of the junior year of high school. Registering for and taking a college entrance exam is the responsibility of the student. Students can register online for the ACT at www.actstudent.org or the SAT at www.collegeboard.com. Students must enter the FBOCS registration code (012-056) at time of registration in order for scores to be placed on the official high school transcript. Scores earned prior to enrollment with FBOCS can be applied to the transcript with the submission of a copy of the official score report. Students should plan ahead for the lengthy online registration process. They will be asked for details about their academic records, and an interest survey will be given. An acceptable student photo will need to be uploaded. Payment will be made online. Students must select a testing site when registering. The ACT and the SAT are administered at various sites throughout the country, usually at public high schools or colleges. A printable admissions ticket will be created at the end of the registration process. This admissions ticket and a photo ID must be presented by the student on the day of the exam. Preparing for these exams in advance is highly recommended. Many helpful books and courses are available. Scores may be improved by studying, preparing, and taking the exams more than once. Students can consider a wider range of college options and earn scholarships by achieving higher scores. Both the ACT and SAT offer practice versions of these tests (PreACT and PSAT) which may be taken during the sophomore year of high school through local school systems. The PSAT test must be taken in the fall of the junior year of high school for National Merit Scholarship consideration. Please note: Parents will need to contact the principal for a School Enrollment Form before going to the Drivers License Office. The information below is given to help parents plan ahead but is intentionally incomplete. Fee amounts and other requirements change regularly, so it is imperative that parents visit this Driver License Document Requirements And Fees link at dps.alabama.gov to obtain the most current requirements and fee amounts. A student who shows up without the correct documents or with incorrect fee amounts will be sent home to schedule a new appointment. Appointments can be scheduled online by visiting this Driver License Appointment link at dps.alabama.gov. Phone appointments may also be made using the information at this link. Many students find out about the Selective Service from their high school counselors, therefore we want to make sure that your student is aware that registration is required. Federal law requires virtually all male U.S. citizens and permanent resident aliens to register for the Selective Service during the time beginning 30 days before their 18th birthday until 30 days after their 18th birthday…a 60 day window. Registration is the process of providing the Selective Service System with personal information, such as name, address, date of birth, Social Security Number and other related information. This provides our country with a means to develop and maintain an accurate list of names and addresses of men who might be called upon if a return to the draft is authorized. It is a civic and legal responsibility. Even though no one is currently being drafted, men are required to register as soon as they turn 18. Registering with Selective Service does not mean that you are joining the military. Failure to register is punishable by a fine of up to $250,000, imprisonment or both. You may register online at www.sss.gov/Home/Registration or at any U.S. Post Office. See www.sss.gov for more details.